IMPORTANT: You should only purchase your Snooper product from a Snooper official Internet supplier. ActiveGPS.co.uk (parent company Active Alliance Limited) is an Official Snooper Internet Supplier No: PP1310. The Snooper authorised Internet supplier network has been created to protect the UK consumer from stolen and counterfeit goods. In addition ActiveGPS.co.uk as an official supplier has the expertise to provide you with the best before and after sales service. Please note: Products purchased from online auction sites such as eBay or unauthorised resellers may be classed as second hand and as a result may not be covered by the Snooper product warranty and could not be suitable for registration. With more than 40 years experience in the in-car technology market Snooper first made their name in radar and laser speed camera detectors which simply detected road side speed cameras such as the infamous Gatso camera. Pictured right: Best selling Snooper S6-R neo detector from 2003. As technology developed, both in catching speeding motorists and the in-car technology designed to alert motorist to their presence. Snooper then started to utilise the US military's Global Positioning System (GPS) satellite network. These device use a database named AURA which includes fixed and mobile speed camera locations along with road speed limits. Being more advanced, GPS locators alert you to speed cameras at a pre-set distance before each camera location. These locations in the database are both fixed and known mobile speed cameras or accident hotspots. Using a GPS database has meant that speed cameras such as Gatso and average speed cameras, which are undetectable to a conventional radar and laser detector are now fully alertable to the motorist using one of their GPS speed camera detector. Today and true their roots, Snooper still offer an detector which uses all three technologies namely radar, laser and GPS in the Snooper 4ZERO Elite BT model. Following on from the Snooper's successful GPS speed camera detector range and with the growing popularity of satellite navigation Snooper then launched a range of in-car sat navs. Early models included the Indago and Syrius and naturally these navigators also included Snoopers award winning AURA speed camera database to provide motorists with speed camera locations along their route. To view the latest range of Snooper Syrius car satellite navigation systems click here. Some years later in 2007 Snooper then started developing truck and HGV specific sat navs. These niche market sat navs used the same mapping as on earlier models, but also encompassed a database of road heights and width restrictions. When using one of Snooper's truck sat navs named Truckmate the user e.g. truck driver or haulage manager can first input the lorries height, width, length, load type, etc. Once this data is known by the Truckmate sat nav safe routes for that specific vehicle can then be calculated. Snooper's latest truck sat navs include the S6800 Pro which includes an impressively large 7-inch screen and with added features of a digital Freeview TV. Enabling you to watch TV when on an overnight stop or waiting for on/off loading. To view the latest truck sat nav range including the Snooper Truckmates click here. Using the same road data information, Snooper have since launched a range of sat navs named Ventura which are designed specifically for drivers of motorhomes and those towing caravans. These sat navs are also pre-programmed with a rich database of camp and camper sites. To view the latest motorhome sat nav range click here. New from Snooper in 2014, the first dedicated sat nav range for drivers of coaches and buses. The Snooeper Bus and Coach dedicated satellite navigation range comprises of five different models, each model is preloaded with UK and Europe maps. The Snooper Bus and Coach range can be programmed with up to 7 different routes and up to 16 different stops along each route too, making them perfect for day trips and coach tours. To view range click here. June 2014 - Another industry first from Snooper with the release of the Snooper SC5700 DVR sat nav (pictured right) - the first sat nav with built-in DVR (Driver Video Recorder). Featuring a 5-inch high resolution touchscreen the SC5700 will not only guide you to your destination, but it also records any incidents along your journey too - thanks to the units built-in HD camera located on the reverse of the units screen. The SC5700 DVR has now been superseded by the SC5900 DVR. 1 - SC5900 DVR Syrius preloaded with either UK and Ireland maps or full European street-level road maps and is ideal for motorists in cars and other small vehicles. Read more about the SC5800 car model. 2 - SC5900 DVR Truckmate preloaded with either UK and Ireland maps or full European maps for drivers of trucks and other larger vehicles. Read more about the SC5800 truck model. 3 - SC5900 DVR Ventura preloaded with full European maps for drivers of motorhomes and those towing caravans and other recreational large vehicles. Read more about the SC5900 caravan model. Dashcams have also been designed to monitor the road ahead for purposes of insurance and peace of mind when driving. These systems also record events when the vehicle is parked which will only record when motion is detected. The curreny Snooper range consists of two models the Mini DVR 1HD and and DVR 5HD (pictured above). The latest product the Snooper DVR-5HD records in Super HD (front camera) and full HD (rear camera). The Snooper DVR-5HD also features a 3-inch colour touchscreen for instant playback of video recorded on the dash cam. View the full range of in-car cameras here. Snooper have also launched a range of golf range finders and other golf GPS systems such as the Shotsaver products that will help you on the golf course. Plus they have designed systems for tracking so you can track in real time your company’s assets, delivery vans, boats or any other vehicle, person or pet. The latest system includes speed limits for all roads across the UK and Western Europe as well as alerts to fixed and mobile speed camera locations using GPS technology. 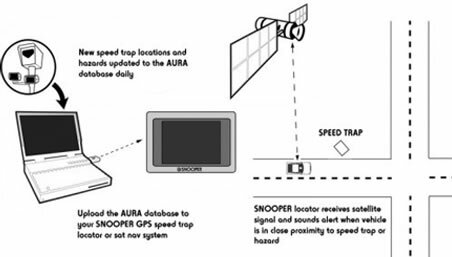 The speed camera detector GPS database developed by Snooper is called the AURA database. This award winning database provides customer with updates to their speed camera database 24 hours a day. The AURA database comprises of more than 34,000 locations across Europe. To celebrate 30 years of trading in 2008 Snooper launched the Snooper 3Zero speed camera detector. (Pictured right). It is called the “3” “zero” meaning ’30’ for 30 years of trading. The 3ZERO replacement, the Snooper 4ZERO Elite BT GPS, radar and laser speed camera detector is now available to buy from ActiveGPS.